It is well known that small and medium sized enterprises (SMEs) are important for innovation and job creation. It was acknowledged in the Review of Civil Litigation Costs by Lord Justice Jackson, published in January 2010, and more recently, in the Hargreaves Review of Intellectual Property and Growth, published in May 2011, that more needs to be done to assist SMEs with their intellectual property rights in the UK. A number of measures and reforms have since been introduced to achieve this purpose. These include reforming the Patents County Court (PCC) and introducing various tax reliefs. In addition, the IPO is currently consulting on proposals to expand the subject matter of its opinion service and to increase its ability to file revocation actions in relation to patents which it opines are invalid. In a series of blogs, these three reforming measures will be examined in more detail. The first blog in this series of three looks at the reforms for the PCC. After widespread reform in late 2010, the PCC is increasingly becoming a court of choice in IP matters, particularly for SMEs. Previously, many SMEs and private individuals were priced out of enforcing or defending their IP rights. The PCC is now suited to handling smaller, less complex, lower value actions, and its procedural rules are targeted to cases of that kind. The result? Shorter, cheaper, quicker litigation better suited to SMEs and private individuals looking to protect and assert their IP rights. Key features of the PCC are as follows: proactive and flexible case management; concise but complete statements of case (pleadings); early case management conferences; no standard disclosure; no exchange of evidence, experiments, surveys or skeleton arguments as standard; and trials that last a maximum of two days without cross-examination of experts. Of additional benefit to SMEs is the costs cap of up to a maximum of £50,000 and damages cap of £500,000. This limited liability for costs and damages is an important consideration in determining whether to take or defend any action in the PCC. Despite the name, the PCC has jurisdiction to hear all IP matters. Currently, all IP claims are allocated to the multi-track and the remedies available to the parties are the same as in the High Court of England & Wales. These include preliminary and final injunctions (interdicts), search and seizure and asset freezing orders, capped damages, accounts of profits and delivery up. From 1 October 2012, there will be a new small claims track for copyright, trade mark, unregistered design and database rights cases in the PCC (patents and registered design cases are excluded). The small claims track will generally apply where the value of the claim is not more than £5,000, the particulars of claim state that the claimant wishes the claim to be allocated to the small claims track and no objection is raised by the defendant in the defence. Interim remedies under CPR part 25 will not be available. This measure should hopefully provide yet further assistance to SMEs and private individuals looking to protect their rights quickly and in a low cost forum. Next week: All change for smaller businesses - tax benefits. This blogger might have missed Vernacare Ltd v Environmental Pulp Products Ltd  EWPCC 41 completely if he hadn't been sent a copy of the judgment last week by Judge Birss QC's clerk. It's a 19 July decision in the Patents County Court, England and Wales, which raises no major legal issues -- though it does carry one useful reminder of something that is not always appreciated. "At the case management conference the order made limited the expert evidence to the issues of obviousness and common general knowledge. There was no disclosure. .. There were time limits on the cross-examination. The limit I set was 45 minutes for each side ..."
Things did not run quite as smoothly as the judge had hoped, though: with the stiff time limits set, the hearing should have been over by lunch -- but an unexpected fire alarm put paid to that good intention. As the holidays end, and everyone returns to work, thoughts inevitably turn to the new court term ahead. Michaelmas Term starts in the High Court of England and Wales on 1 October and with it come those court applications that have been contemplated and prepared over the summer vacation, but not considered suitable, or urgent enough, for vacation business. For those who are less familiar with the Court system in England and Wales (and quite often for those who are...), making a court application can be a confusing and tricky business. There are always several stages. The first stage tends to be to determine the status of the person making the application (for example are they a party or a non party -- hopefully this is not too difficult to do) and to decide what the application is for. Without careful thought an applicant can be flummoxed by the court asking “What is it you want the court to do?”, to which a frustrated applicant is tempted to answer “Isn’t it obvious?!”. This can ideally be avoided by some initial thoughts as to whether a party is seeking a decision, a remedy or permission to do something. Once that is decided, it is always a good idea to look at the Rules. Generally the Civil Procedure Rules (CPR) Part 23 is a good place to start, but the trick is to appreciate that other parts of the CPR and Practice Directions can also apply and vary CPR Part 23 for specific applications. The Chancery Court Guide, particularly Chapters 5 and 6 can be useful and, for Patents, CPR 63, the Practice Direction and the Patents Court Guide will need to be consulted. In working out which Rules and Guides to take note of, an applicant will need to first determine at least what type of application you are making. For example, will the application be determined on paper, by telephone or at a hearing, will it be made by consent or is it opposed, ex parte or inter parte, on notice, or without notice? The next stages of completing the application notice, drafting the order sought, working out the fee and issuing and serving the application follow. Evidence in support of the application will need to be drafted, filed at court and served on all parties. If the application is to be determined at a hearing, bundles, a skeleton argument and statement of costs will need to be prepared ahead of the hearing. Once the hearing has taken place the order will be drawn up, sealed and served. After all that, another holiday is probably in order. Next week: "All change for smaller businesses"
“The present litigation system is unsatisfactory as it is in general difficult to address European-wide infringement in an efficient way. This is due to unfortunate decisions of the ECJ in GAT-LUK and Primus-Roche (here). With a wise ECJ all the stuff we talk about today would have been superfluous. Readers of this blog may have their own thoughts on this subject, particularly the bit about "asking the litigators to stop worrying about their future income". It is accepted that litigators exist for the benefit of their clients and not vice versa, that patent litigation is expensive and that clients, in a free market and with perfect information at their disposal, will gravitate towards whichever way of resolving a dispute is the most beneficial to them -- in many cases, this means the cheapest. However, there is a large gap between what clients pay and what litigators take home. Much of this gap is accounted for by disbursements and expenses necessarily incurred in the course of litigation; more still is swallowed up by a proportion of the litigator's office overheads -- heating, lighting, office rent, salaries of non-fee-earning staff, employers' liability insurance, professional indemnity insurance, subscriptions to legal information services and law reports, and so on. 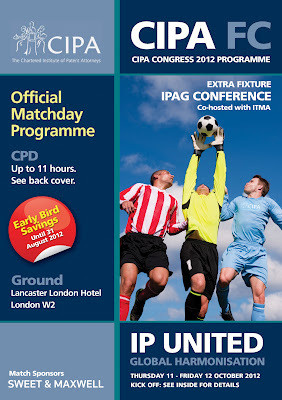 The Congress programme can be accessed here; registration here. In Eli Lilly & Company v Human Genome Sciences, Inc  EWCA Civ 1185 the Court of Appeal for England and Wales was retro-fitted with Sir Robin Jacob in order to return to tidy up some loose ends in the straggling litigation between Eli Lilly and HGS over the patentability of a invention where the patent correctly identified the polypeptide as a member of the TNF ligand superfamily, listing a long description of its activities and uses, but without any back-up scientific data to support a description which the trial judge (Kitchin J, as he then was) depicted as being not so much as a description as a prediction based on knowledge of other members of the TNF superfamily. 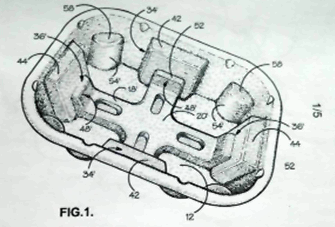 In short, Kitchin J held the patent invalid here in July 2008 for lack of industrial applicability, insufficiency and obviousness; the Court of Appeal unanimously upheld his decision in February 2010 here,on the industrial applicability point and did not rule on the other issues. After the Supreme Court -- to the surprise of many and the dismay of quite a few -- reversed this decision, it remitted the case to the Court of Appeal, here, so that the question of insufficiency of three of the claims could be considered: two had been ruled insufficient at trial and HGS appealed, arguing that they weren't, while a third was ruled sufficient at trial and Eli Lilly appealed on the ground that it wasn't. The Court of Appeal allowed HGS'a appeal and dismissed Eli Lilly's. The reasoning of the Court appears to be based on well-established principles of claim construction rather than on any ground-breaking principles of law. The decision in this case have been music to the ears of GlaxoSmithKline, which purchased HGS only last month. The patent in this case, for Neutrokine-α, is said to have an important role to play in dealing with autoimmune diseases and B-cell cancers. While the purchase of a patent-based company while it is in the middle of protracted litigation is always a risk, the risk was minimised here by the fact that the case was, unusually, on its way down to the Court of Appeal following a ruling from a superior court rather than on the way up to it, which both limited the scope of the Court of Appeal's decision-making and made it easier for GlaxoSmithKline to refine its purchase plans. One issue that has vexed courts and commentators for several years is whether a method claim may be infringed when all the required steps are performed, but by more than one entity. In an earlier case, BMC Resources, Inc. v. Paymentech, L.P., 498 F.3d 1373 (Fed. Cir. 2007), a panel of the U.S. Court of Appeals for the Federal Circuit held that a single defendant was liable for direct infringement, even if it did not itself perform all the required steps, when the acts were committed by the defendant’s agent or a party acting pursuant to defendant’s direction or control. See Mark Lemley, et al., “Divided Infringement Claims,” 33 AIPLAQJ 255 (2005). To consider conflicting views on the issue, the Federal Circuit recently granted en banc review in two consolidated cases. On August 28, the court issued a sharply divided en banc decision in the cases. Akamai Techs, Inc. v. Limelight Networks, Inc., Case Nos. 2009-1372, -1380, -1416, and -1417 (Fed. Cir. Aug. 28, 2012). In a 6-5 decision, the court ruled that issues of divided infringement are better handled as induced infringement under 35 U.S.C. § 271(b), rather than direct infringement under § 271(a). In order to permit that approach to work, the court rejected its prior authority holding that induced infringement only exists when a single third party has committed direct infringement. Instead the court majority held that the induced conduct itself could constitute the required direct infringement, even if the required method steps were performed by two or more entities (or even in part by the defendant). Thus, even though a defendant did not direct or control others in performing the various steps, it could be liable as an infringer under §271(b) if (1) it knew of the patent, (2) it performed or induced third parties to perform the steps of the claimed method, and (4) the steps were all in fact performed. (Note that under the Supreme Court’s decision in Global–Tech Appliances, Inc. v. SEB S.A., 131 S.Ct. 2060 (2011), a patentee proving active inducement also must show that the defendant acted with actual intent to cause infringement (or, alternatively, with “willful blindness”). Five judges dissented. Judge Newman accused the majority of ignoring the issue for which en banc review was granted (and the only issue briefed and argued), namely, the proper standard for direct infringement in divided infringement cases. Judge Linn, joined by three other judges, argued that the majority’s decision usurped the policy-making function of Congress by retooling § 271 in a manner inconsistent with a long line of prior authority. The opinions (all 100-plus pages worth) are available here.